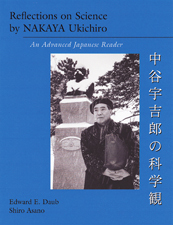 Offers selections from the popular writings of internationally famous Japanese snow and ice scientist NAKAYA Ukichiro. Included here are excerpts from his classic The Methods of Science (Kagaku no Hoohoo) and other literary essays discussing science in relation to cultural and social topics. At the time of his death in 1962, the American Meteorological Society Bulletin heralded him as "the world's outstanding scientific investigator of snow crystals." English translations accompany some Japanese texts, vocabulary notes accompany all texts, and a glossary concludes the book.